A former teacher, Lynette gave up her career in education a few years ago in order to focus on her writing and thus fulfil her childhood dream. She writes contemporary women's fiction, usually involving romance, and often with suspense or a supernatural twist. She claims 'Killing Jenna Crane', a romantic thriller is her personal favorite to date. Lynette currently lives in an early Victorian cottage (the inspiration for her latest story ‘Cocktails and Lies’) in a picturesque Surrey village. When she's not reading or writing, she enjoys catching up with friends, visiting the theatre or cinema, and occasionally trying to tame her out-of-control garden and the family's eccentric cat. 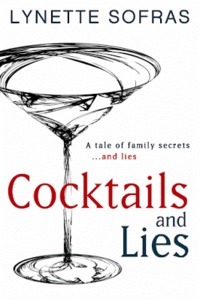 Thank you so much for featuring 'Cocktails and Lies' on your excellent blog, Kayelle - especially since today is its release day. Thank you for your kind welcome Kayelle. Alice, lovely to meet you. Thank you so much for sharing the details of my book.